There will be no prize to guess the most valuable form of intangible asset in today’s business world. It’s nothing but the intellectual property rights (IPR). However, in order to bring this definition to sound natural to human ears it took about 140+ years. Yes, it all started in 1873 when the refusal rate of attendance had seen its high, with the foreigners refusing to showcase their exhibits in the International Exhibition of Inventions in Vienna, Austria, in fear that their brainchild would be stolen and commercially exploited in other countries. Understanding the gravity of the situation, and in the interest of protecting work of the intellectuals in other countries, Paris Convention was adopted in 1883. It applies to industrial property rights in the broadest sense that includes patents, trademarks, industrial designs, utility models, service marks, trademarks, geographical indications and the repression of unfair competition. Provided here is a brief history with a few important events in the IP regime until the World IP day was designated on the 26th day of April 2000. The World IP day is celebrated with a different theme every year, but with a common objective to encourage science and technology, the artistic and literature works, encouraging the registration of marks, and geographical indications. All in all, it is one of the several attempts to encourage and promote IP. 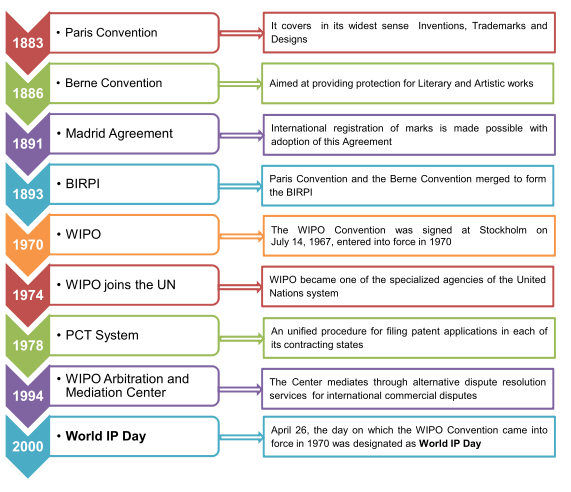 The following are the themes for different year’s World IP Day that helped in improving the level of awareness in people about patents, copyrights, trademarks and designs, and their impact on everyday life; role of IP in promoting creativity and innovation; encouraging respect for IP rights; and celebrating its success. Below is a glimpse of the years and the associated themes. World IP Day Themes including the theme for 2017 (Source: WIPO)The World Intellectual Property Organization (WIPO) assists its 189 member states in developing a balanced international IP legal framework to meet the evolving social needs. Rapid growth in every field of science and technology in the last three decades is a visible testimony of WIPO’s role in synchronizing the global IP activity. Notable expansion in the global IP space also corroborates WIPO’s role in conquering the apprehension of inventors to bring their inventions to public. The IP filing activity across the world has recorded a positive surge year over year. A detailed study of the IP filings in IP5 offices (USPTO, the European Patent Office (EPO), the Japan Patent Office (JPO), the Korean Intellectual Property Office (KIPO), and the State Intellectual Property Office of the People’s Republic of China (SIPO)) from 2004 to 2015 proves that all segments of IP have grown at a sound pace. IP activity considering the filings of Patents, Trademarks and Designs, has grown by over 140% in the past decade, thereby advancing science and technology, and standing as an evidence in affirming a greater level of awareness among the people. Fresh ideas complemented by the secured mechanisms to make them public are resulting in continuous innovations that in turn give a continually improved standard of living, which is the theme of this year’s World IP Day “Innovation – Improving lives”.